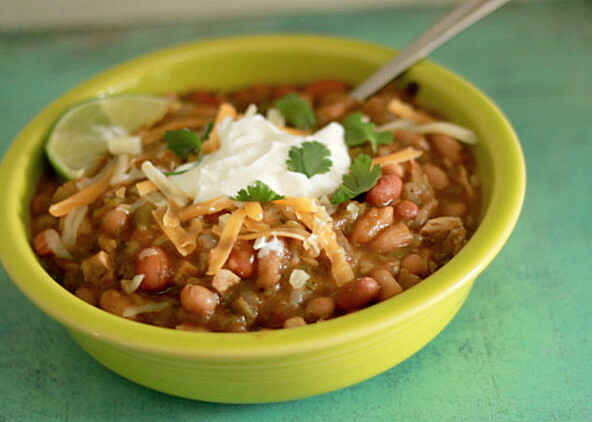 White kidney beans and hearty pinto beans simmer together with a rich vegetable broth, green chiles, diced fresh jalapeno pepper, and warming, comforting spices like cumin, oregano, and – believe it or not – a little touch of ground cloves. Add in some chopped cooked chicken at the end of the process, and – look! – vegetarians and carnivores can live together. 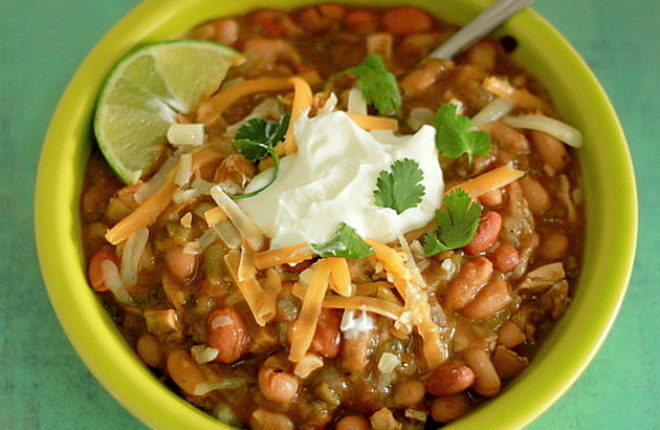 It didn’t really occur to me how much we like chili in this house – and how much I must make it – until I realized that this is the third chili recipe I’ve posted here in as many months. I guess there are worse things to be a little obsessed with. This healthy vegetarian white chili is among my favorites. 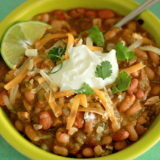 White kidney beans and hearty pinto beans simmer together with a rich vegetable broth, green chiles, diced fresh jalapeno pepper, and warming, comforting spices like cumin, oregano, and – believe it or not – a little touch of ground cloves. Add in some chopped cooked chicken at the end of the process, and – look! – vegetarians and carnivores can live together. Topped with a little shredded cheese, sour cream, fresh cilantro, and a wedge of lime, this white chili is plenty satisfying without the chicken. But it’s nice to have options, right? In a large saucepan, heat the olive oil over medium heat. Cook the onion, stirring occasionally, for about five minutes, until soft. Stir in the garlic, cumin, oregano, cloves, cayenne pepper, and salt. Cook for another minute. Add diced green chiles, beans, and vegetable broth. Continuing over medium heat, let the mixture come to a boil, then reduce the heat to love to keep the soup at a steady simmer. Simmer uncovered for about an hour. If adding chicken to a portion of the recipe, scoop just under half the chili into a separate, medium saucepan. Add the chicken to that half. Simmer both versions for another 30 minutes uncovered. I add one jalapeno – with seeds – for just a touch of heat, but you might want to add two (or more) if you really want some fire. I rub bone-in, skin-on chicken breasts with olive oil, kosher salt, and pepper, then bake them at 350 degrees for about 40 minutes until a fork inserts easily into the meat and the juices run clear. Then I remove the meat from the bone, discard the skin, and chop. This looks fantastic! I’ve actually never tried a white chili before, but it looks so good. Made this last night. So freaking good! I ran out of cumin so I subbed in some smoked paprkia and chipotle powder. I also added 1/2 bag of frozen spinach at the end to up the health factor. For the chicken, I cooked up some chicken thighs in the oven and then threw them in the KitchenAid mixer to shred them while still warm (love that trick!) and then added to the chili. Thanks for the recipe…will totally make again!! Very tasty! Made the vegetarian version. I used 1 can each of black beans, cannellini, and pinto. Then I chose to mash the beans up a bit after 30 minutes of simmering. Cloves were definitely a nice addition. Thanks!! THANK YOU, THANK YOU, THANK YOU! Many frustrations and arguments in my house because of my vegetarian daughter and meat loving husband. I have been finding recipes and trying to cook them with meat and without. My husband was the cook until my daughter gave up meat. I have been learning how to cook for the last year now because i am worried about my daughter getting all the nutrients her body needs. You will never know how grateful I am to have found your website. This is the best chili I have ever had! I have made it many times and it’s so good every time. It has proved to me that I can enjoy foods even though I do not eat meat anymore. Thank you!